Starting on the border of the county of Dalarna in eastern Värmland, the Svartälven ("Black River") is one of Sweden's best canoeing waters. 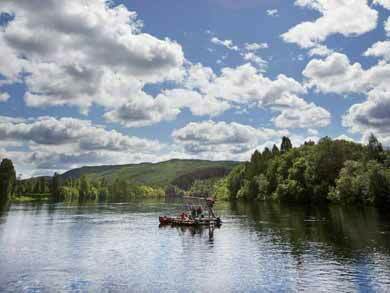 From its source, the river runs south through a landscape of outstanding natural beauty. This canoe tour passes through a network of winding rivers, narrow passageways and small lakes and requires a number of land crossings, the longest being about 2 km. A canoe wagon is included as part of standard equipment to help with the portages. The Svartälven region is a wonderful area for canoeing. The rhythmic "swoosh-slop" as your paddle breaks the surface and cuts through the water, your canoe gliding smoothly forward as you slip in silence through the surrounding forest landscape - a canoe tour on the river Svartälven provides an ideal mix of tranquility and adventure. The freedom to camp wild along the route is one of the privileges of the Swedish outdoors. Photo: James Horton. 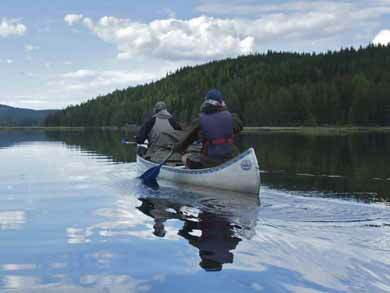 Canoeing on Svartälven is a self-guided canoe expedition, a voyage of discovery taken at your own pace. 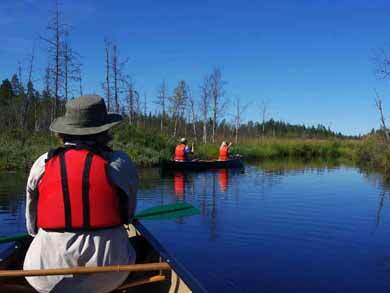 The waters may be calm and slow-flowing, but the area offers a real canoe adventure. The tour runs in a remote area and you will be leaving "civilisation" behind you as you strike out into a world of water, trees and sky. There is no timetable on this trip - you will be deciding yourself what distance you wish to cover each day, and selecting your own camping spot each night. You will choose when to rest and when to push on, when to take a day out to explore the many tributaries flowing into the Svartälven, or perhaps leave your canoe for a while and explore the beautiful surrounding area on foot before returning to the water. The rhythm of your days will be dictated only by your own inclinations. The canoes you will use on the tour are two-person Canadian canoes - stable, easy-to-handle canoes with space for luggage and camping/kitchen equipment. No previous experience of canoeing is necessary. Taking the chance to do some fishing is a popular option during the tour. Photo: PK. Canoeing in this area of Sweden gives you excellent opportunities for intimate and personal encounters with some of the area's rich, and normally shy, wildlife. Canoeing is a quiet and unobtrusive activity, and you may find that the animals are much less wary of you than they would be if you approached on foot. If you are lucky, and quiet, you may spot a beaver curving gracefully towards you through the water, just its head visible above the smooth glassy surface. As you round a bend in the river you may come across an elk, the mighty King of the Forest, stooping to drink by the water's edge or perhaps striking out skillfully for the opposite bank - elk are excellent swimmers! In the skies above, eagles and buzzards accompany you on you journey, wheeling high in the air, their lonesome keening cries echoing for miles across the treetops. Each evening you will sit around the campfire, recounting your impressions of the day as the sun dips below the horizon and planning for the day ahead, or perhaps you will retire early to conserve your energy for the morning's paddling - the choice is yours! Paddle three persons in one canoe. This reduces the level of challenge but note that this option will limit available space for packing (this option is not recommended if your party is only three persons in total). Extra person uses sit-on-top kayak as alternative to canoe. The majority of packing for this extra person will then be carried in one of the canoes. A trolley is provided for the kayak to assist with land transports. Why not combine your canoe tour with Timber Rafting Taster and try some timber rafting during your trip? Your canoe adventure begins at the canoe centre in Gunnerud, where you will receive your equipment and have a pre-tour instruction meeting. You can also trace out the route onto your map if you wish before the tour begins. Fishing licence covering designated sections of the canoe tour can be purchased at the canoe centre. You will then load the canoe equipment onto the minibus for transfer to the start point for your canoe tour. High season: Check-in is between 13.00 and 14.00. Low season: Start time is by arrangement between 12.00 and 17.00. 4-day tour: For Saturday starts, your tour begins at the north end of Älvsjön. You paddle south through a particularly scenic area, up the winding Tvarälven and north-west to finish just below Lesjöfors. For Tuesday starts, the route is the same but is paddled in the reverse direction. There is nowhere to shop along the route - for the 4-day tour you must take all provisions with you from the beginning. Total distance around 35km-40km. The 4-day tour requires 2 land transports, both less than 600m in length. If you wish, the standard route can be extended by planning detours into side lakes and river systems. 7-day tour: Your tour starts at the borderline between the two counties of Värmland and Dalarna. Where Svartälven has its outlet in Kattsundet you launch and load the canoe, then head south. At the beginning you paddle through Kattsundet, Norra Laggen and Södra Laggen until you reach the village of Gustavsström. Here you make your first land transport. The route continues down through Älvsjön and through the Tvarälven before swinging north-west to pass through Lesjöfors to end at Västra Sundsjöön. There are some small stores along the route (but please note that you should not rely on these stores for essential provisions) and one larger store around two-thirds of the way through the tour. There are also cafes and a campsite along the route and at one point you have the choice to take detours upstream into tributaries, where you have good chances to see beaver. Total distance around 75km. If you wish, the standard route can be extended by planning detours into side lake and river systems. High season: 4-day canoe tours beginning on Saturday will finish with pick-up on Tuesday at 17.00 (back at canoe centre around 18.00). 4-day tours beginning on Tuesday will finish with pick-up on Friday at 13.00 (back at canoe centre around 15.00). 7-day canoe tours starting on Saturday will finish with pick-up on Friday afternoon at 14.00 (back at canoe centre around 15.00). 14-day canoe tours starting on Saturday have pick-up on Friday afternoon at 14.30 (back at canoe centre around 15.00). Low season: Pick-up time is by arrangement between 12.00 and 17.00. 4-day tour: Start days Saturdays and Tuesdays between 22.06 and 27.08.19 (last start 27th August). Check-in between 13.00 and 14.00. 7-day tours: Start days Saturdays between 22.06 and 24.08.19 (last start 24th August). Check-in between 13.00 and 14.00. 01.05-21.06.19 and 25.08-30.09.19 (latest end date 30th September). Start any day (except Sundays) by arrangement between 12.00 and 17.00 for a minimum of 4 adults. Smaller groups are also possible, charged at the full rate for 4 adults due to custom transfer logistics. Prices include full kitchen equipment. High Season/Low Season tours: During High Season, standard per person prices and start days apply. For tours during Low Season, there is a minimum charge of the cost for 4 adults due to custom transfers required. See under "Dates" for more information. NB: Maps are not included, but are essential for the tour. Maps must therefore either be added as optional extra or purchased independently - please see below for details of maps required. Groups: Price per person regardless of age. Group rates apply for group size min. 14 persons. Sleeping bag package: Includes sleeping bag, sleeping bag liner and foam sleeping mat. Provisions package: See image below. The food provided is that eaten by a typical Swedish family. At the start of the tour you will be given a provisions box with the food for the trip (if you have specific dietary requirements, please let us know so that arrangements can be made). The exact contents of the package may change depending on the season and availability. The food is purchased from small, local countryside shops. Typical contents include: bread, butter, cheese, juice, milk, yoghurt, muesli, coffee, tea, salami, jam, meatballs, fishballs, Swedish beef stew, ham, sausages, pork loin, mashed potatoes, onions, carrots, vegetables, beetroot, apples, biscuits, tomatoes, cucumber, rice, macaroni, asparagus soup, cauliflower soup, salt and pepper. NB: If choosing provisions, please note that for organisational reasons all persons travelling together must choose food packages (i.e. it is not possible to split packages or to purchase for only some members of a group). You are also welcome to bring your own provisions for your tour if you wish. Tent: See image below. High quality 3/4-person Hilleberg tents. Please note that, like all tents rated 4 persons, the tents are most comfortable for 3 adults. Maps (required): Note that these are purchased, not hired, and are yours to keep. Maps required for 4-day and 7-day tours are 626 Hagfors and 627 Fredriksberg. Maps can be purchased independently through The Map Shop. Alternatively, you can order maps through us and collect them along with the rest of your equipment in Sweden. Fishing: Simple fishing equipment and also fishing licences can be purchased at the canoe centre on arrival. Maps are essential for this tour. Maps can be ordered independently or as an optional extra - please see "Optional extras" below. Canoe equipment: 2-person Canadian canoe, paddles, buoyancy aids, one waterproof pack barrel (approx. 60 litres) and one waterproof dry bag (approx. 40 litres) per canoe, water can (5 litres), canoe rope, canoe trolley, toilet spade, cleaning sponge and rubbish bags. For odd-numbered groups, please specify when booking whether you would like to paddle three persons in one canoe or would like sit-on-top kayak for odd-numbered person. Kitchen equipment: Trangia hurricane stove* with fuel, cups, plates, cutlery, carving-knife, cutting board, spatula, cheese slicer, whip, butter knife, can/bottle opener, potato peeler, bowl, dish brush, washing-up liquid, kitchen roll, matches and storage box. Instructor: Instruction meeting before your tour starts. Transfers: Transport by minibus for participants and equipment from the meeting point to/from the start/end points of the tour. Nature Card: To preserve the local environment all adults canoeing in the Svartälven area are required to have a "Nature Card", the proceeds of which go towards management of the area. Food: For the 4-day tour, you must bring all provisions with you from the beginning. For the 7-day tour, there are some small stores along the way (though we do not recommend you rely on these for essential provisions) and one larger store with regular opening hours in Lesjöfors, about two thirds of the way along the Svartälven route. Swimming ability required by adults. All participation at own risk. Minimum 2 adults. You should be in good health and have a reasonable level of fitness and strength. The tour takes place on calm, slow-flowing rivers with some lake sections. Around 10 land crossings are necessary during the 7-day (fewer for the 4-day route), the longest of which is about 2km. During the land transports the canoe can be transported on the canoe trolley but you will need to carry your other equipment. Though not as demanding as Canoe Tours in Bergslagen, children much younger than 10 may find Canoe Tours on Svartälven demanding. Please check with us if you have any questions regarding your suitability for the tour. 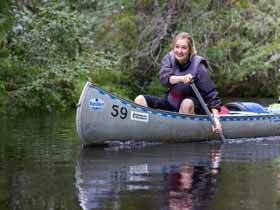 If you would prefer a canoeing holiday suitable for younger children, you may wish to consider a less challenging tour such as Canoe on Klarälven. The tour takes place in a reasonably remote area with wild camping on all nights and requires some land transports, but overall has a generally moderate level of challenge. Canoe on Svartälven is ideal for groups. We reserve the right to assign large groups to designated camping spots to minimum impact on the local environment. You can choose to fly to Stockholm, Gothenburg or Oslo airports. From here, you travel by public transport to Karlstad (around 2.5-5.5 hours depending on options chosen). From Karlstad, you travel by local bus to Gunnerud (around 1.5 hours). You can also choose to travel by hire car. Ferry Dover-Dunkirk or Newcastle-Amsterdam for onward connections to Gunnerud. The 14-day version of this tour combines the 7-day for Canoe Tours in Bergslagen and Canoe Tours on Svartälven. The 4-day version of this tour makes a convenient combination with Timber Rafting Taster if you'd like to try some timber rafting during your trip.